♦ Sales reached $ 25 billion with global luxury handbag accessory export only. GEUMDO HARDWARE LTD is a company that earns money with exports not domestic sales. Production bases are all abroad and only head office is in Seoul. This company is quite unaffected by the recession of domestic market on this account. GEUMDO HARDWARE LTD produces handbag accessories. Metal item is the main item among others. It earned them about 25 billion last year. ♦ Since supply to COACH, founded in 2006, the company has grown up with bag accessories. COACH’s orders account for 90 percent of our annual revenues. Other sales also from American luxury handbags company such as Michael Coos, Marc Jacobs. Orders come in from other companies, but there are so many of COACH’s order and we couldn’t get other orders. GEUMDO ranked 3rd among the COACH RMS(row material supplier). They got Best customer service Award from COACH. 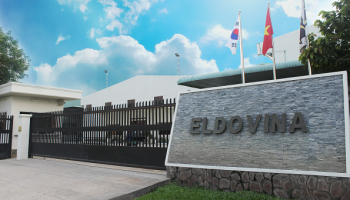 ♦ In 2007, GEUMDO has advanced to China and working 2 factories but they set up a Vietnam local corporation in last year and are increasing production density in Vietnam due to the increase in wages and restrictions by the Chinese government. Advance into Vietnam is successful so 2nd factory is under construction. Handbag accessories such as Ring, Zipper, Turn lock and Dogleash should be exquisite and keep high quality. The difference between luxury brand and imitation brand is accessories. Imitation can emulate the originals but is inferior about detail. On this occasion, Geumdo Hardware was, for the first time ever, recognized and awarded for the potential contribution to international trade in general, and to Korean trade in particular. This event also saw the first $US1mil Export Milestone for Geumdo Hardware Ltd., which was a worthy merit for the aspiring contribution of its business. One year after the first $US1mil Export Milestone recorded, Geumdo Hardware Ltd. once again won recognition for its triple growth: $US3mil Export Milestone achievement. This went to show that Geumdo Hardware Ltd. was on its right track for making things better soon down the road. On this event, $US10mil Export record was seen for Geumdo Hardware Ltd. This was a great, stable growth in the industrial service that Geumdo had maintained and achieved over years. Given all the achievement which has been seen, and with the firm speed of development, it’s for sure foreseeable that Geumdo’s buniness is to become stronger and stronger in years to come.